Union Pacific 1417, Argo Yard Seattle, July 27, 1961. The F3 locomotives began making their presence known on the Union Pacific in 1947. Among my “favorite” units, the F3 had a very utilitarian look about it, with the chain link fencing to keep the crew in and the critters out. As with Canadian National Railways so-called “Type E” stations, “Phases” of General Motors cab units was manufactured by ferroequinologists. And just as the Canadian National Railways never had a “Type E” station floor plan, General Motors never had “Phases” in their product line up. These were contrived by rail fans to keep track of progressive model improvements, or, in the case of the railroad stations, to separate that plan from others. Of particular interest with the Union Pacific 1417 is the “wings” logo painted across the nose of this cab unit. The “Wings” logo first appeared in 1939, and disappeared in the 1960’s. The “Wings” hit the rails again in 2000 (see page 7) and remain through current production models. 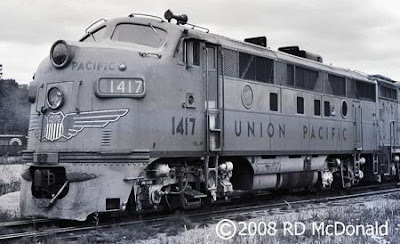 Railroad Stuff: Union Pacific 1417. Built as an F3A road number 1417A, 1,500 horsepower, January 5, 1948, serial number 4622. Renumbered 1417 in August 1948. Retired to Electro-Motive Division in June 1964.